Pain Medicine 18.8 (2017): 1598-1600. Koning, Henk M., et al. Percutaneous radiofrequency lesion of the superior cervical sympathetic ganglion in non-traumatic neck pain. The Pain Clinic 12.4 (2000): 271-279.
article radiofrequencied 100 cases of non-truamatic neck pain. 6% had temporary worsening of pain lasting up to 2 months; “4% reported a change in sensibility in the painful region ” ?more tender or more numb?? Comment – remarkable results but few trained to do this procedure; first article is from Chile. 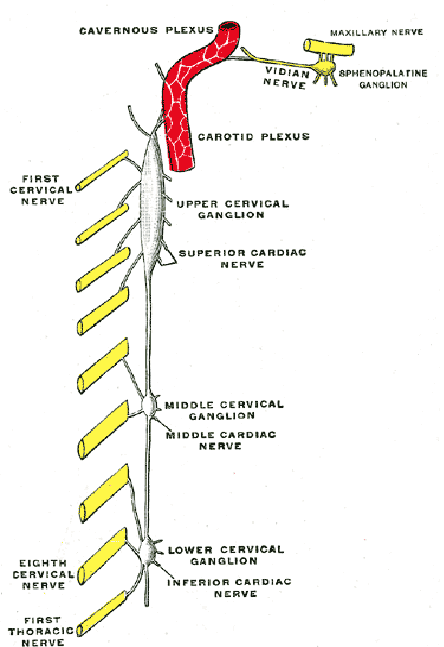 Going in over c3 facet is exactly where upper superficial cervical plexus lies and so you might end up going through it to get to this deeper ganglion. Hopefully more will be published on this subject as it sounds very promising. This entry was posted in Headaches, Neck. Bookmark the permalink.